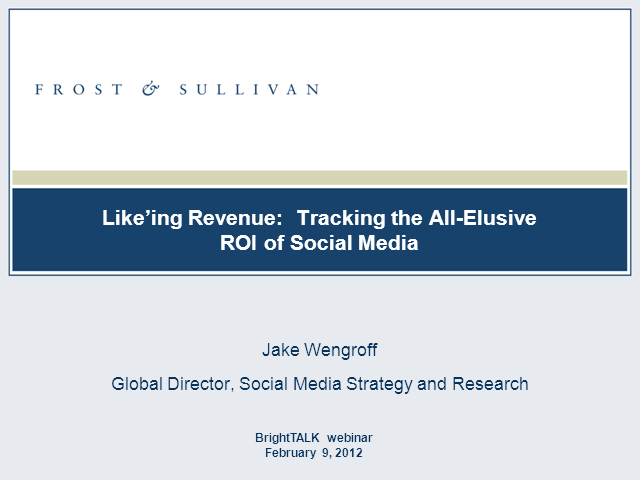 social media efforts to sales and revenue. Social Media has received a tremendous amount of media coverage over the past few years, but the business-to-business (B2B) approach is usually left out. Consumer sales are frequently smaller, easier and sexier, but with larger budgets. It is time for B2B marketers to learn that social media is a better fit for their type of relationship-based sales, and applying this framework to their campaigns will accelerate their marketing careers. Lead Generation isn’t a dirty word. Social Media isn’t about hugging customers. These two seemingly at odds forces, when combined, offer the fuel needed to launch a marketer’s career to superstardom. Using never-before published methodologies and frameworks, this webinar will empower marketers to be a key driver of business growth and success. It exists to transform the often under appreciated marketer into a superstar to be admired by C-level executives and lauded by the sales team. Join us as we explore key sales and marketing issues with insights from B2B sales and marketing opinion leaders regarding their solutions for overcoming them. •What makes a strong sales person? What makes a great marketer? Is there a future for sales and marketing integration? To make social media work in a regulated industry like finance and healthcare is a challenge many are facing. Hear from Chad Bockius of Socialware as he moderates a panel featuring leading experts from finance and healthcare, sharing how they’ve leveraged social media in their role, challenges they’ve faced and the key to using social media successfully. From problem child to child prodigy, social media will clearly be the most watched, discussed and measured portion of the marketing and communications mix in 2010. As the medium matures and begins to be integrated with other corporate efforts, several trends are sure to evolve and surface, most notably that senior management is expected to take a more hands-on role, and that measurement tools will be taken much more seriously. Social media for the most part costs nothing, but since it requires a large commitment of time, companies will seek to measure the ROI of that time and whether it truly makes a difference to the brand and the bottom line. Over the last few years the Marketing and PR teams have begun to converge and ground zero is the web. Media mentions no longer represent simply gaining exposure, it can and should be part of your search engine marketing strategy. How you format press releases, communicate hyperlinks, which media publications you seek placement in and how you capture this on your own website are all part of the marketing/pr mix for the smart organization today. The content headache arises when an organizations possesses too much (or too little content). These conditions occur when the content has not been mapped into the sales process. A formal audit of available or required content to complete a selling cycle will reveal where your gaps or overflow exist. By auditing your content and matching it to the sales process you can ensure that you have neither too much nor too little content. Finally, your content should appeal to your audience and we have some basic tips to avoid producing content that fails to move your audience. In a world of community empowerment, media is fighting for survival as its editorial voice struggles to compete with the web's peer-to-peer conversations. Are analysts bound for a similar destiny? Are these very communities the future of research, market intelligence and vendor reviews? Picture sophisticated social networks of highly targeted professionals - connected by powerful Web 2.0 tools and platforms - who not only generate content but also share the insights and conduct the research which analysts have become synonymous with. Will analysts be able to compete with the immediacy and fluency of these peer-to-peer conversations? This round table discussion will aim to answer these questions and look at the future role of analysts in this new landscape. Marketing experts share tips and best practices for achieving success with email, social media, demand generation, mobile marketing and other trending topics. You will walk away from the live and on demand webcasts with practical advice for your strategic and tactical marketing initiatives to achieve your business goals.